I find strange things on my trails fairly often, but today I found one of the strangest. I found a leash, with nobody attached, just hanging around by itself. 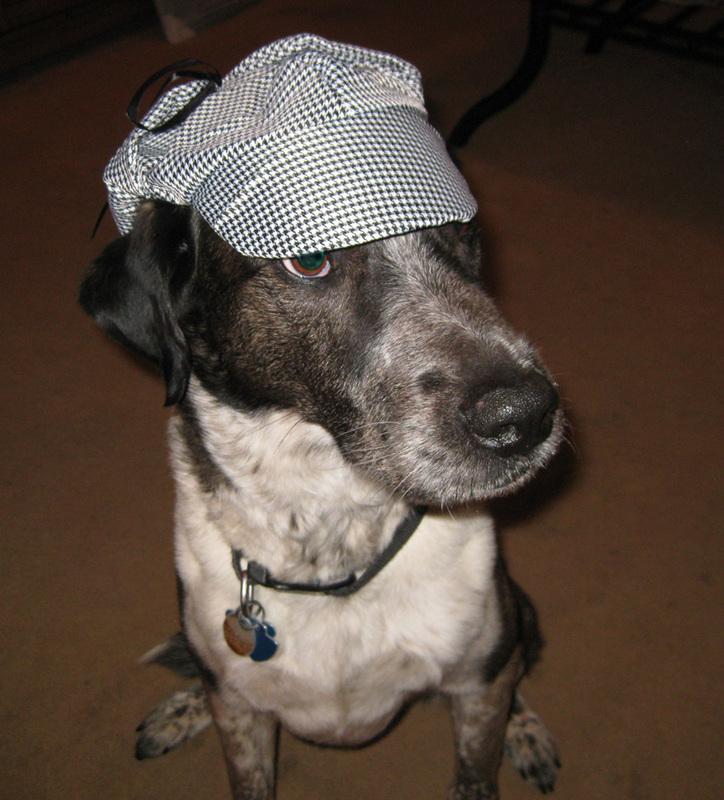 Time to get on my Detective Dog hat and start looking for clues. Hmmm. I’m picking up some scents, but I’m not sure what it all means. Hey wait a minute. One of the scents on here is mine – from yesterday. So much for solving this mystery by the smells around here. Somewhere on my trails there is a dog running around without a leash. And there is also a person on my trails who is not attached to a leash. I’d better go look for that person and that dog. They might be lost from each other. Maybe I could be a hero and reunite them. Wait a minute. What’s this? What is this, National Lose Your Leash Day? Maybe I can find some clues around this one. Hmmm. I think this might be some kind of conspiracy. Somebody might be trying to keep Detective Dog busy so they can pull some heist somewhere else. They’re not going to succeed though, because I found out something that they don’t know. This second thing isn’t a leash at all. It’s a strap with clips on it so people can attach their stuff. So when those people pull that heist, they’re going to discover that their strap is missing. And they’ll have no way to carry all the stuff they stole. I’d better go now and find out where they dropped all that stuff. Maybe they dropped some treats. What an idea… they might indeed have dropped some treats!!! Marina, I’m still trying to find where they dropped all the stuff. I hope some other dog doesn’t find it first. Aha! 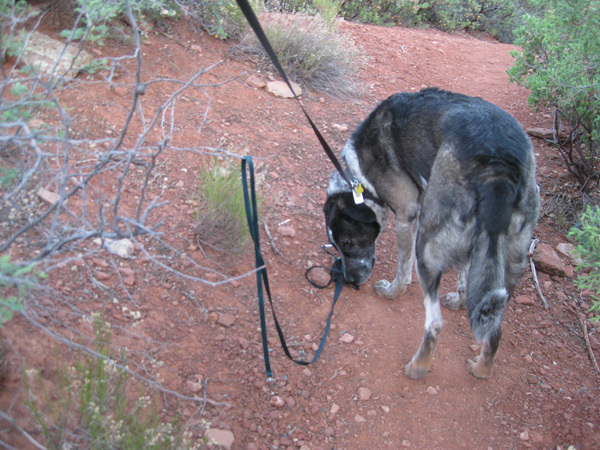 It’s the old strap-that-looks-like-a-leash-trick! They ALMOST had you fooled, but no. Once the detective hat is on, there is no fooling you, B.
Cupcake, they sure were trying to distract me – but nobody can fool Detective Dog. What did you find?? Completely curious here, Detective Dog :)! Roberta, I’m still looking for the dropped stash. I hope some other dog doesn’t beat me to it. Bassa, I would be so disappointed if all they were doing was pulling a big bag of rocks. There’s no treats in there. Little Binky, as long as I can smell those treats I’ll find them. Kevin, I’ll go back and check those rocks right now. I hope the rocks don’t cover up the smell so I can’t find them. I’ve seen people walking invisible dogs on those silly leash things but usually there’s a person on the other end – don’t know why they don’t just get a dog, but some people are weird. Good thing it’s not a real leash because that could mean you’ve got a lost dog AND lost person somewhere out there. 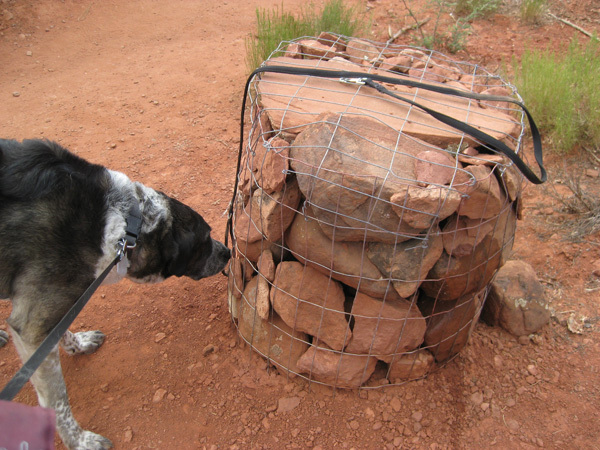 Then it would be Bongo the Searcher dog. Lola, I might have to get a new hat if I need to go searching. 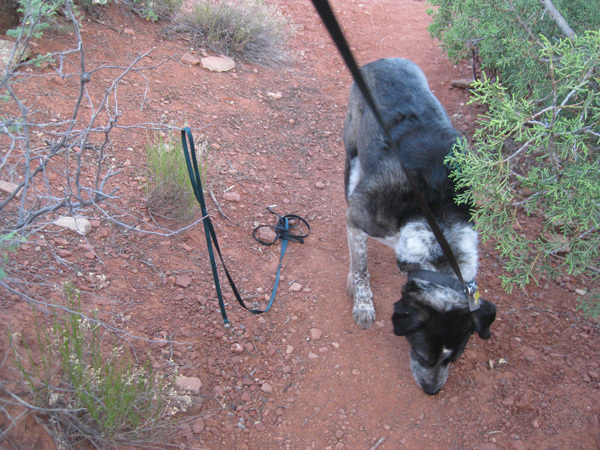 At first I thought maybe someone had left you a new leash but seems you have a real mystery on your paws. Misty Shores, this mystery has my stymied. I’m still looking for the treats. 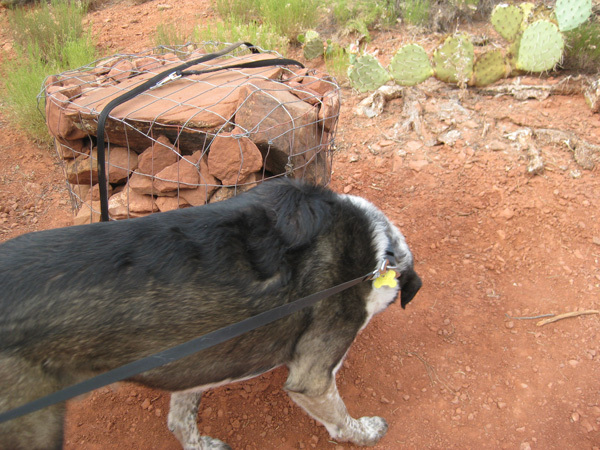 Tried somebody to walk stone-dogs on those leashes? Perhaps a stone-person? Kolytyi, stone dogs and a stone person? Now that’s a real mystery. I think I’d better investigate. Thanks Donna. It’s my favorite hat to wear. And thanks for stopping by and commenting. Treats? Did someone say Treats? Collies on the way to help you!!! Come on Collies! I could use all the help I can get – and there’s sure to be enough treats for all.